I have hundreds of business books on my shelf. This one stands out. My friend Todd gave me a copy three years ago and it stayed with me because it was so simple and easy. This book is ideal for entrepreneurs and someone who runs a privately held business and has hit the ceiling. 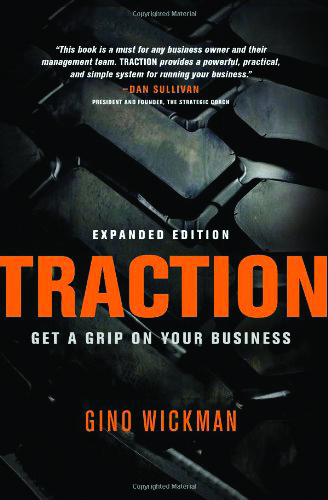 Traction, Get a Grip on Your Business, is not a flavour of the month business book. It is based on real world experience, practical wisdom and timeless truths. The book describes a system called the Entrepreneurial Operating System, or EOS. EOS makes it really simple to run a business. It identifies six key components that business owners need to focus on strengthening: vision, people, data, issues, process and traction. What Gino Wickman describes is a complete system to help a business owner do three things. With the EOS system, your entire organisation becomes crystal clear on your vision, more disciplined and accountable, gains traction and advances as a healthy team. There are three ways to implement the EOS system in your business. The first, “Self Implementation”, is to do it yourself by selecting one of your most capable leaders to teach and facilitate it. The second is “Supported Self-Implementation”, where you join the EOS community for a small monthly fee. Finally, you can engage a professional Implementer to lead your team through the journey and hold you accountable. I was so impressed with the EOS system that I decided to become a “Certified EOS Implementer™” myself so I can help businesses grow. I am convinced that by reading this book and applying its core principals, you can eliminate all of your business related frustrations. It will help you get more of what you want from your business. Give me a call on +44 7795 667480 to find out how I can help you introduce EOS into your business. I simply want to tell you that I’m new to blogs and definitely loved this web site. Almost certainly I’m going to bookmark your website . You surely come with tremendous writings. With thanks for revealing your blog site.